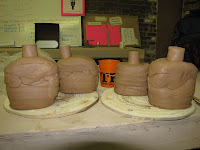 Went into Clayworks on Saturday to finish up my glazing for the cone 10 kiln firing that was slated for Sunday night. The usual Saturday crew was there and it was fun catching up with everyone. In between glaze layers I did some hand-building with slabs in earthen red to pass the time. 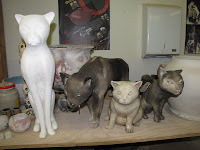 Turns out the kiln firing has been postponed since there is not enough student work. We will try again for September 13th. The hardest part will be staying away from the studio until September 16th when classes start. It feels like an eternity. Maybe I need to start knitting. 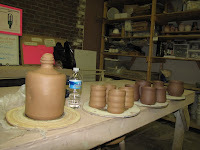 Went to the studio tonight to handle some mugs and glaze some pots. 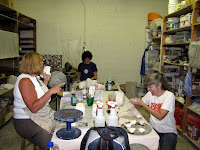 Saw Becky and Elaine there and got to see their work from Susan Halls' class at Penland. It's quite amazing! I can't wait to see what they will produce with their mad new skills. the rabbit Susan Halls made. You can see the rest of their class work here. Part 1a of an Yixing Teapot demonstration by Mrs. Zhou Gui Zhen from Dingshan. 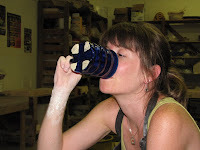 I worked on handling some of my mugs and promptly forgot to take pictures of them. I also brought my Gary Rith tea set in to show some folks. Only one person was there tonight, and she really liked it. 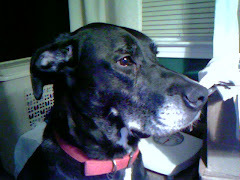 She's trying to stay anonymous since she doesn't like having her picture taken. I will bring it back tomorrow night since more people will be in the studio since many people want to see it. Check out Gary's blog here. I went into Clayworks for a while on Saturday AND Sunday this weekend. I got a lot done (but never as much as I wished to accomplish). It was great to feel productive after being so washed out by the heat in the studio lately. I finished up most of my orangestone and switched to earthen red to make some more mugs and and "paintable" pots. Unfortunately my reclaimed porcelain (helios) is not quite ready --it still has the consistency and look of vanilla icing. 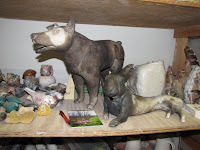 I enjoy working with all different types of clay. 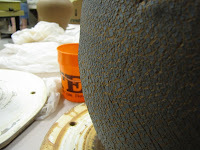 Each clay influences the type of pots I throw, but I love to mix it up. 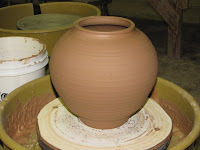 I was thinking this afternoon that I haven't seen anyone make really tall pots in earthen red, so I'll have to try it. 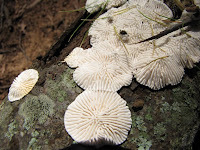 When I got home from Clayworks I went out to put some watermelon rinds in the compost pile and saw some more fungus. It's everywhere this year with all the rain we've had. from running through the compost pile. It's a whole forest in miniature. 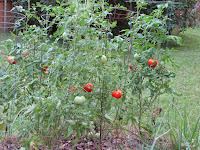 So many tomatoes, so little time. I purchased a teapot set from Gary Rith and it arrived today! It's wonderful and I am displaying it proudly. I can't help but pick up and handle them every time I walk by them. Thanks Gary! 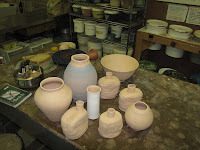 Folks at Clayworks begged me to bring the set to the studio so I am planning on taking it there on Sunday. Please check out Gary's work here, and tell him I sent you. 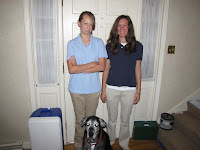 Meredith and Stephanie (and Binkley). 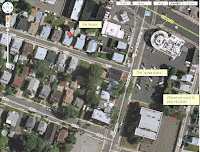 When I was a kid growing up in northern New Jersey, there was a "pizza place" around the corner --literally. Three houses up to the corner and one store (a barber shop) away. I don't remember the name of the place (it being just "the pizza place") and I don't remember the name of the owner although I spent a lot of time both inside and walking past it to school and other stores and friends houses. I do remember that pizza was twenty-five cents a slice and Sicilian was thirty. Sub sandwiches were one dollar and during the making of one of those sandwiches the owner explained that I should always put the oil and vinegar on the bread. Good advice sticks with you. Stores don't. Later the storefront became a photo studio and then an insurance office. I don't remember buying a whole pizza from "the pizza place", although I'm sure we did at one time or another. 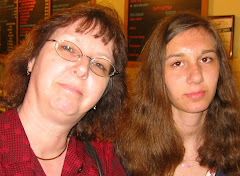 Our family pizza place was Angelo's, a take-out only place a little more than a quarter mile away. Well within walking distance, but not if you like your pizza hot. So we would call in the order and then drive. The folks at Angelo's made great pizzas for $2.50. (I know, I'm old.) On a Friday or Saturday night, there wasn't even double parking available in front of the place so we'd have to park in the A&P parking lot next door and I would have to hoof it around the corner for the pizza. After "the pizza place" around the corner closed, I gravitated to "The Pizza Pub" across town (one square mile of a town). I was hanging out with my high school friends at that point at The Pub and even after we started driving we would end up there more often than not when we wanted a snack. The Pub always had three shakers on the tables: parmesan cheese, red pepper flakes, and oregano --lovely oregano. To this day when we get a pizza I look for the piece with the most oregano on it. During my high school years another place opened called "Hogan's Heroes" that only sold sandwiches (no pizza) and hot dogs. My friends and I would walk (that's all we could do) to "Hogan's" and get sandwiches or sometimes hot dogs with everything on them (kraut, mustard, chili, and relish). The woman who owned it got to know us pretty well and we'd hang out and talk for a while sometimes. Once she asked me and my friend if we liked rice pudding and gave us two good-sized tubs that were getting close to expiring. She wouldn't take anything for them, saying she just didn't want them to go to waste and rice pudding wasn't selling well. 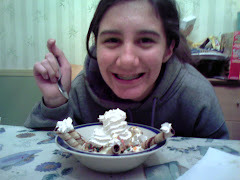 I will always remember walking down the street in a light, chilly drizzle, eating rice pudding with my friend, Leo. Long before we moved to the town with all those places we lived in another town with a sandwich place three doors down and four up, across from the Grand Union supermarket. "Roma III" gave me my introduction to Italian subs and I will forever be grateful to them. It was 1966 and I would beg money from Mom for a sandwich. Whenever she gave in, I would head over there with my crew cut and "my" money clenched in my fist. I couldn't wait to order my Italian sub and put that money up on the counter, running home with my prize to unwrap it on the kitchen table and guard it from my mooching little brother. Our willow oaks in the front yard threw some more limbs down at us last week and I finally got around to cleaning them up today. 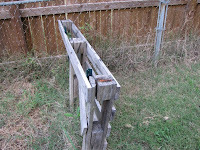 I took my trusty bow saw, cut them up and took them to the curb. 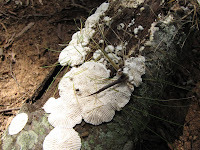 During the course of my sawing I noticed some very pretty fungus growing on one of the logs and set it aside until I was finished and could get my camera. 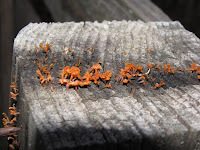 I am familiar with all the lichen (photo), moss and fungi we have everywhere (we're even growing lichen on the concrete sidewalk), but I hadn't seen this species before. It looks like something you would expect to find on a coral reef, but there it was in our yard. 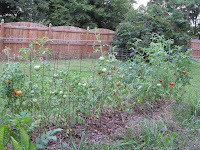 I'm constantly amazed without venturing beyond our 1/3 of an acre. that are fuzzy and just starting to develop the ribbing. Those green, grassy looking blades appear to be growing out of the fungus. Went to the studio on Wednesday night to get some things done. I slaked and mixed my reclaimed porcelain (helios) using the drill with the mixer blade. 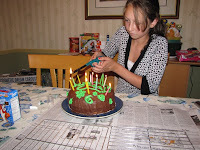 Once I got that done and cleaned up the mess, I got to work. 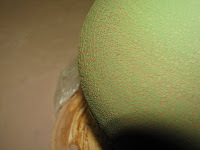 A week before I had thrown another one of the stretched pots with sodium silicate on it using chrome green slip and I pulled that out to check on it's drying progress. It was a lot wetter than I thought it would be after a week on the shelf. That plastic really seals the moisture in sometimes. I let it sit out for a while and then wrapped it more loosely when I put it back. I started out with ~9 lbs of orangestone and threw the next pot. After trying to pull it up as tall as possible and trimming, it's probably got 7 to 8 lbs left in it. I used the technique that Andy Smith taught us of pulling up in thirds: Get the walls even, then pull up the top third of the pot, followed by the middle third, and then the bottom third. It works really well to get the most height out of your cylinder and I'm becoming more comfortable with it. Thanks Andy! I was surprised at how far I could push the sides out in relation to how thin I had pulled the walls. Let's see if it makes it through the rest of the process. 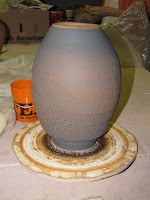 While making this pot the throwing lines and the shape made me think about paper lanterns. 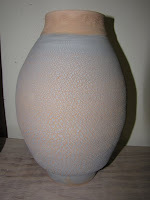 I think I want to try a series of pots based on paper lanterns. 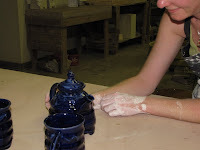 I have lots of different underglaze colors with which to decorate them so they could be very interesting to explore. Wish me luck. Inspiration for the paper lantern series. 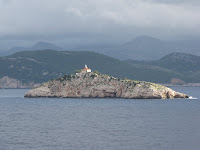 Before breakfast I made it up to deck 10 to photograph our entry into Dubrovnik, Croatia. It was very scenic and I shot LOTS of photos. 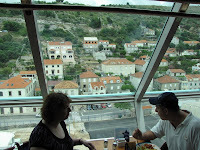 We had a nice breakfast in the Windjammer and then took our shuttle bus into Dubrovnik. 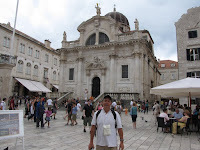 The city was very beautiful and had lots of winding streets and alleys with outdoor cafes and tourist shops. It was all made of a white stone with marble walkways. Before we left, several people told me that it was beautiful and they were right. The people were very friendly and all spoke English. They took kuna (the native currency which means "marten" in Croatian since it is based on the use of marten pelts as units of value in medieval trading) as well as Euros and most places took American dollars too. 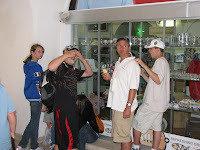 At the time of our visit, there were 5 kuna to a dollar and seven to a euro. I picked up a T-shirt and we had some more gelato. There were several artists selling original paintings in the square by the wall. One did all his villagescapes in shades of blue. These were hauntingly beautiful and I told him so (13 euro). Another one painted watercolors that I thought were marvelous, especially for 10 euro, but Karen didn’t like the style. Both artists painted in a kind of (what I will call) a Slavic style (think Russian) with varying black outlines and dark shading. All were mounted on mat board as a backing. Hvala means “thank you” in Croatian. It started spitting rain at us and we decided to grab a shuttle back to the ship just as the sky let loose with a quick shower which soaked us before moving on just as we got on the bus. Once back on the bus, it was off the Windjammer for lunch and then back to the docks for some more souvenir shopping before going back for our regulation afternoon nap. I set an alarm to wake up at 16:30 to watch the departure so Eva and I went up on deck and took lots more photos. All too soon it was 17:30 and time to get ready for dinner. Tonight I had the shrimp and crab salad, the slow roasted beef shoulder filet with tender-crisp zucchini, summer squash, onions in reduction and mascarpone mashed potatoes, and the Triple Choco-Chino for dessert. Eva ordered a bottle of Chilean Merlot (in Hector’s honor) and we enjoyed that with our meal. It was on the dry side with a nice flavor that wasn’t overpowering and complemented the beef and vegetables very well. Tolga gave us the answer to last night’s brain teaser: Add a line to “10 10 10 = 950” and it becomes “10 To 10 = 9:50”. Pretty good. Hector took two napkins and made a rose in a water glass. He then told us he was going to transfer energy through the table and told Audrey and Justin to put their index fingers flat on the top of the table and their thumbs under them under the table. He then balanced a very full water glass on their index fingers and told everyone Goodnight. Poor Audrey and Justin couldn’t move. He came back once more and lined up two spoons and a half-full water glass and flipped the second spoon right into the water glass on his first attempt. I’m going to miss dinners on the ship. Later we went to the Anchors A Weigh lounge and watched the Quest Adult Game Show. This was like a scavenger hunt for people in the audience. The MC (Bill, the cruise director) called out, “I want to see your team number and the shoelace out of a shoe”, for example. The teams all rushed up with their team placard and the shoelace. It got crazier as the game progressed. Some of things he called for were a man carrying lady's nylons over his arm (as in carrying a woman wearing nylons to the front), an appendectomy scar, a tattoo, a man’s shirt (not worn), a man wearing a ladies bra on his head, ladies wearing a wait staff members vest or an officer’s jacket, and finally, a shirtless man wearing a ladies bra, shoes, makeup and a purse. It was a giggle-fest as you can well imagine. After that, it was late night pizza followed by a cup of tea, then bed. Church on the way into Dubrovnik. 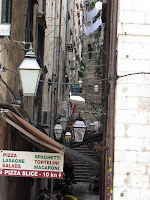 Side alley (with steps) off the main street. 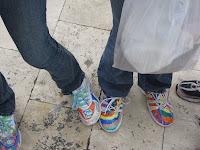 Meredith and Stephanie decorated their sneakers. Uncle Scott in the square. The folks at the (closed) tourist center. Karen and Scott in the Windjammer Cafe. The rest of the pictures can be found here and here. Saw an interesting wikihow article on "moss graffiti" and am thinking about how I can use it at home. I don't really want to write anything, but I wouldn't mind adding more moss to my landscape using this technique. I really do like moss. More artwork here and here. Saturday I took some of mine and Becky's work to the Eight Legs Gallery in Waxhaw. We are both excited to have work at Eight Legs and the gallery crawls that are being discussed in Waxhaw. If you have a chance, stop by. 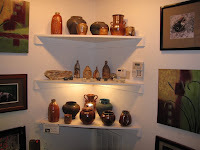 Our pots at Eight Legs Gallery. 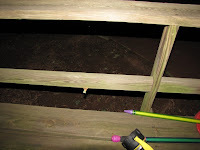 I went out at about 1:30 am to let Binkley out and noticed a cicada molting on the bottom rung of the deck railing. I always find the discarded shells, but rarely catch the actual molting. 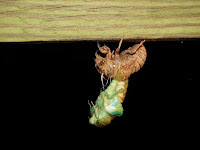 Oh, it's a cicada emerging from its old shell. 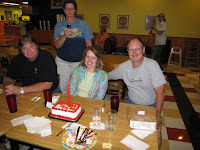 Friday night we met Pam, Chip, Tom, and Lisa at Elliot's Barbecue to celebrate Pam's birthday. 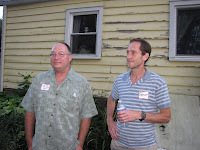 As usual the food was excellent, and when you add in good friends it's always a winning combination. Tom, Lisa, Pam, and Chip. 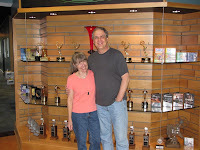 I stopped by Concentrix Music on Friday to pick up some of Becky's work and got the grand tour from Fred. I was blown away by all I saw. The studio is state-of-the-art and beautiful to look at as well. All I could keep saying was "Wow!" (yes, yours truly was actually at a loss for words). 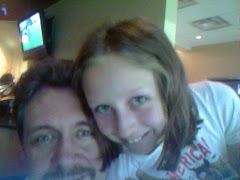 Becky and Fred at Concentrix. 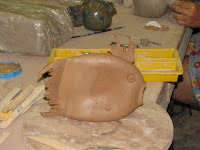 When I got to Clayworks Wednesday, Trish (and her daughter), Lisa, and Joe were working on making fish pots. Pretty cool fish, too. 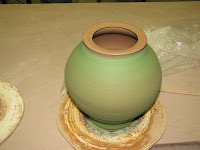 I made another stretched pot with chrome green slip, but I put everything away before I took any pictures. Pictures to come soon. Sunday I woke up much later than I had planned (go figure) and headed into Clayworks to do some glazing. I had a lot of different pieces to finish and it took me quite a while. 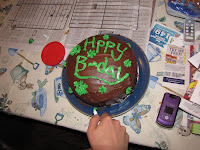 We celebrated Greg's birthday on Saturday and I think I can safely say that everyone had an excellent time. It was a warm day, but nobody seemed to mind a bit. 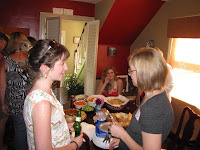 Combine good friends, good food, assorted beverages and several hula hoops --how can you go wrong? 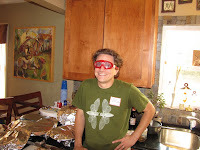 Dave modeling his new eyewear. Julie and Amy (probably talking clay). 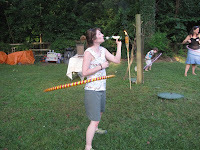 while maintaining her hula hoop. The birthday boy and his sister. Joe and Pete solving the problems of the universe. It's a hula hoop convention. Greg gets his hoop on. Kit goes for three hoops. Got to the studio Tuesday and Wednesday this week. Finished up the first batch of bottles Joe showed me how to make. Thanks Joe! I really like these forms. I also threw a neck on my stretched pot to finish it off. It is mighty warm in the studio at this time of year. I keep hoping it will lead to weight loss, but so far it hasn't helped me or my pots. My stretched pot with a thrown neck. 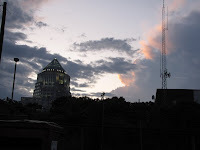 Storm clouds at sunset in back of the studio. 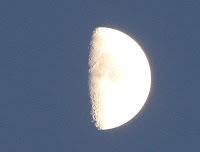 A 20x zoom can capture quite a lot (even at ~240,000 miles). 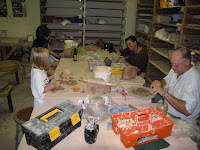 Saturday was a clay day and a lot of the gang was at the studio. Cindy, Scott, Kim, Nat, and Elaine. 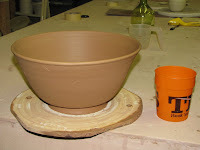 Pot with slip, sodium silicate, then stretched. 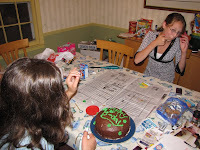 Monday was Meredith's birthday and Stephanie baked her a cake --and decorated it (in text message format). Oy. 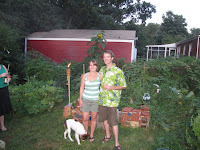 We bought more HUGE tomatoes, peaches, and a cantaloupe at the farmer's market on Saturday.